Heineken, which traces its roots back to 1864, is one of the world’s leading international brewers. Their beers are available in almost every country on the planet. In fact Heineken have the widest presence of all international brewers, due to their global network of distributors and 115 breweries in more than 65 countr ies. At the Cork, Ireland brewery (originally Murphy Brewery est.1856) Heineken produce the following brands: Heineken, Amstel, Coor’s Light and Murphy’s Irish Stout. Currently the plant is dedicated to large pack in 20L, 30L & 50L kegs. It was appreciated that many smaller outlets such as clubs and smaller pubs would benefit by receiving the beer in smaller volumes to ensure freshness and quality. The solution was to supply the market place with the option of beer in 20L kegs known as ‘David’ kegs. The challenge faced by the production team was to fill 20L David kegs on the existing filling line which was designed to handle 30L & 50L kegs. The dimensions of the David keg meant that the line, in its current configuration could not without great expense, handle these automatically. The main limiting factor was the conversion of the de/re-palletiser. Also significant was the general line change-over to handle the smaller diameter of the Davids. Mr Frank Maher (Technical Services Manager) and his colleagues at the Cork plant had the task of developing a system to handle the Davids. Ultimately a workable solution was found to handle them with the development of a bespoke pallet for safe delivery to the market and an innovative system to transport the kegs on the existing line. The design brief given to Enterprise Tondelli was to design and implement an automated and integrated system to replace the current manual system. In particular there was a need to eliminate the manual handling of the kegs which raised Health & Safety issues. This was in accord with Heineken’s responsible employer and continuous improvement policies. 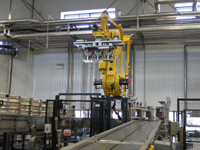 To automate the packaging process and to design out the undesirable aspects of the current operation entailed a complete study of the current line conditions, operating philosophy, space available and materials in use, etc. To achieve this there was close collaboration between the project teams of Heineken and Enterprise Tondelli. In overview the concept is to receive the empty David kegs palletised. These are then de-palletised into specially designed carrier shells which transport the kegs around the filling line. After washing, filling and coding, etc., the kegs are then re-palletised. The David kegs would flow through the line concurrently with the normal production of 30L or 50L kegs. Enterprise Tondelli were the main contractors on the project and were appointed because of their thorough approach and the comprehensive yet competitive solution proposed. Enterprise Tondelli provided all parts of the project from the design and project management, to the supply and installation of the equipment, to the final commissioning, documentation and handing over. All aspects of the project were conducted and recorded in accord with CDM regulations. The Distribution Pallets: A study of the existing bespoke pallets found them to be unsuitable for a number of technical and operational reasons. Therefore, a new but economic pallet was designed for the safe transport of the kegs. A modified 1200 x 1000 wooden pallet was used for this. 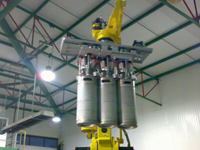 The kegs being set out and located in an arrangement suitable for robot de/re-palletisation. The Carrier Shells: Essentially these shells are 30L kegs modified or re-engineered with a bore to accept the David keg. Once again these are engineered to the tolerances required for robot handling. The shells loaded with empty kegs are then let out into the main production flow and pass through the various keg washing and filling stages. An RFID system (with transponder attached to the shells) was employed for identifying the Davids as they passed through the system. (ie. to signal the correct filling volumes, to divert to the palletiser, etc.) Once arriving at the palletising take off point the kegs are diverted to the palletising zone. Once they have arrived and are marshalled into the unloading zone the Davids are removed from the carrier shells by the robot and are loaded onto the waiting pallet. The complete system is protected with fail safe Health and Safety guarding for the protection of the operating personnel. “We are very happy with the way that Enterprise Tondelli handled this project. From the very initial development phases right through to completion they carried out the project with the utmost professionalism. We required a complete solution which Enterprise provided. We also found that communication was very good so that we were always aware of the project status and the issues being dealt with. This was important for a number of obvious reasons, but also because of the tight integration required with our existing production line. Enterprise have delivered to our business an effective and comprehensive solution to the ‘David’ problem.” – Frank Maher, Technical Services Manager. “As engineering manager I was particularly interested in the quality and reliability of the solution proposed and also the logistics of installing the new equipment with minimal line downtime. Also I wanted to make sure that all components used in the build of the project complied with our site standards. Enterprise came up with a plan that accommodated all of our requirements and were also very co-operative in ensuring that all components complied where possible, without compromising the final solution. We were not disappointed!” – Paddy Quinn, Plant Engineer. Enterprise Tondelli with their partners Comac are specialist providers of keg handling and racking solutions. They have worked for a number of the largest brewers in the world and are continually growing their customer base. The Enterprise portfolio extends far beyond kegging equipment. They also supply complete bottling and packaging plants for soft drinks, beer, cider, wine and water. This includes whatever technologies are relevant and a complete service from initial design and tender through to commissioning, acceptance trials and hand-over. The scope of supply can be from a single machine inclusion to a complete large scale turnkey project.